I’ve been trying to reduce the amount of coffee I consume every morning. 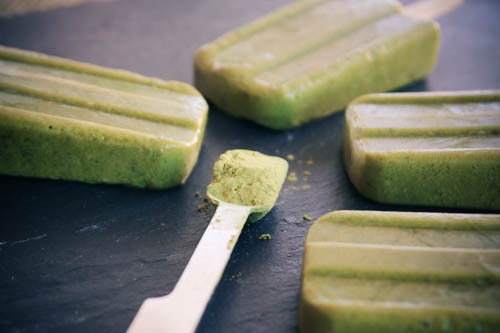 It’s only kind of working, but I have found that replacing some coffee with the grassy taste of matcha (matcha is a powder made of green tea leaves that have been finely ground) has been a fun diversion for my jittery self. 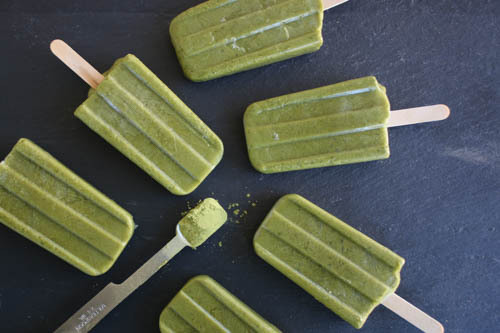 And, as you know, I love popsicles and have enjoyed making coffee-themed breakfast pops like these Pumpkin Spice Lattes on a Stick, so I thought I’d give matcha a try in pop form. I played around with the recipe and found that super simple is best with these babies. These are also dairy-free which is helpful for us IBS peeps. Mix all ingredients in a medium size bowl. Whisk until powder is fully dissolved. Soak your popsicle sticks in warm water. After an hour in the freezer, insert popsicle sticks. Freeze for four to six hours, but preferably overnight. 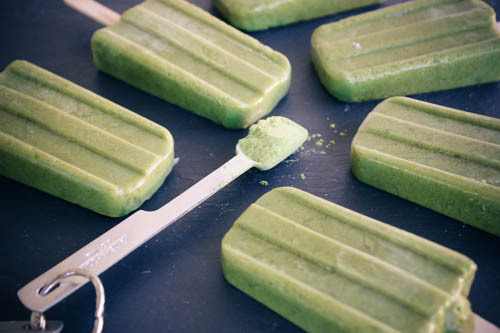 Thanks so much for these simple and healthy alternatives to store bought frozen treats. Great money saving treat!